This data set has been replaced by the Provincial Digital Elevation Model Version 3.0. The source data used in generating the Provincial Digital Elevation Model Version 3.0. did not support the construction at a resolution finer than 30m, which is now used in the Version 3.0 product. The Digital Elevation Model - Version 2.0.0 is a 3-dimensional raster data set which captures terrain elevations and covers the province of Ontario to the 51st parallel composed of 150 tiles. Cell resolutions are 20 metres in northern Ontario and 10 metres in Southern Ontario. The provincial DEM was interpolated using five main datasets: i) Contour Line ii) OBM-DTM iii) Spot Height iv) Water Poly Segment v) Water Virtual Flow The DEM is used for mapping hydrologic features (e.g. watersheds, stream networks) and is an essential data layer for surface water and groundwater flow modelling. The Provincial DEM is also used for a broad range of studies related to the fields of hydrology, forestry, ecology and climatology. The provincial DEM is used for mapping hydrologic features (e.g. watersheds, stream networks) and is an essential data layer for surfacewater and groundwater flow modelling. The Provincial DEM is also used for a broad range of studies related to the fields of hydrology, forestry, ecology and climatology. The OBM Contour dataset was used to interpolate elevations for the DEM. In areas where OBM DTM data was not collected in the province, OBM Contour and OBM Spot Height datasets were used as the primary datasets to derive elevations for the DEM. Input elevation datasets were used to interpolate DEM elevations using ANUDEM 5.1.0 software. OBM Contour data was collected through the OBM program and updated between 01/01/1976 to 01/01/2002. The Water Virtual Flow dataset was used to enforce flow in the DEM to ensure that drainage will occur in the down-slope direction. Input elevation datasets were used to interpolate DEM elevations using ANUDEM 5.1.0 software. Water Virtual Flow data was collected through the OBM program and updated between 01/01/1976 to 01/01/2002. The OBM DTM is a dataset was first filtered to correct for a striping artefact present within the data. Input elevation datasets were used to interpolate DEM elevations using ANUDEM 5.1.0 software. OBM DTM data was collected through the OBM program and updated between 01/01/1976 to 01/01/2002. The OBM Spot Heights were incorporated into the DEM in two ways: i) identifying elevations for Water Features Area polygons (lakes and double-lined rivers). Water Features with valid elevations were then converted into shoreline contours to add into the interpolation process for the DEM, and; ii) Spot Heights were used in conjunction with the Contour dataset to add addition elevation points during the interpolation process. The data set was first filtered to ensure that Spot Height elevations conformed with the adjacent contours. Input elevation datasets were used to interpolate DEM elevations using ANUDEM 5.1.0 software. OBM Spot Height data was collected through the OBM program and updated between 01/01/1976 to 01/01/2002. The Water Feature Area dataset was used to identify all lakes, reservoirs and double-lined rivers in the province. In cases where water features were assigned elevations photogrammetrically during the OBM program , an OBM Spot height was associated with each feature. 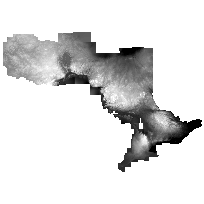 By spatially relating the OBM Spot Height dataset with lake polygons, consistent lake elevations were identified. These lake elevations were then used to construct a lake contour dataset which was integrated into the DEM for additional elevation information. Water Feature Area data was collected through the OBM program and updated between 01/01/1976 to 01/01/2002.